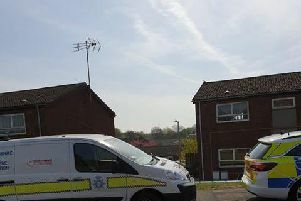 A teenage boy was able to escape a house fire that spread through a Warsop home. The 13-year-old was the only occupant in the detached home on Cherry Grove on Thursday evening when the blaze is thought to have started upstairs. He was able to raise the alarm and fire crews from Warsop, Edwinstowe, Mansfield and Worksop, spent more than three hours at the scene. Neighbour, David North, said his wife spotted smoke billowing from the house at around 5.30pm. He said: “I saw the lad outside and he seemed panicky on his mobile phone. “I went out and told him not to go back inside. “I opened the door about six inches and it was just thick black smoke, and it just got worse. He would not have stood a chance if he’d gone back in. “By the time the fire service arrived the smoke was terrible. “They had to break a top window just to let the smoke out. “Luckily there was no-one else inside, but the young lad was quite upset. More than 14 fire crew members used breathing apparatus to get inside the building and used hose reel jets to bring it under control. The fire service said the boy was taken to hospital by ambulance as a precaution and later released. Another witness, who watched the fire unfold said the family dog had also been rescued through the back of the house. The man, who did not want to be named, said: “There was black smoke pouring out of the top vents on the side of the house. “I couldn’t see any flames but the smoke started coming out of everywhere. Fire officers say they are still investigating the cause of the fire.